A second and third community workshop on the planning process for Mariners’ Mile may be held prior to 2017 according to the city. The sessions provide the public an opportunity to discuss the future of the 1.3-mile of land along Coast Highway. City hopes community workshop will jumpstart planning process, but will village maintain its boating theme? NEWPORT BEACH — Many harbor destinations up and down the California coast are being considered for redevelopment projects aiming to draw as many tourists and visitors as possible to patronize boutique shops, local businesses and restaurants. Whether such plans benefit or come at the expense of boaters is a fair question to ask. One waterfront region up for redevelopment is Newport Beach’s Mariners’ Mile, a 1.3-mile stretch of Coast Highway once known as a haven for boatyards, marinas and yacht brokerages. Since 2014 the city has actively sought out ideas and plans to make Mariners’ Mile a visitor-serving destination. The village is already home to high-end automotive dealerships, art galleries and restaurants. Newport Beach hosted a community workshop on July 25 to review the process for the Mariners’ Mile Revitalization Master Plan and receive public input. More than 70 attendees engaged in what city staff described as “very spirited discussions” about the future of Mariners’ Mile. Business owners, homeowners and stakeholders mostly attended the workshop. Makana Nova, an associate planner with Newport Beach’s Planning Division, said the city is considering all options of how Mariners’ Mile ultimately shapes up, as there have been so many studies and workshops offering different perspectives of how to redevelop the 1.3-mile stretch of Coast Highway. The general vision for Mariners’ Mile’s redevelopment, according to the city’s presentation, is to enhance vitality for residents and visitors, create distinct centers, build pedestrian-friendly mixed-use villages, ensure enhanced view corridors, and offer a mix of visitor-serving retail, marine-related businesses and limited housing along the harbor’s waterfront. City staff stated a revitalized Mariners’ Mile would balance the interests of residents, bicyclists and businesses. A study of the Pacific Coast Highway corridor conducted by Orange County Transportation Authority and Caltrans identified Mariners’ Mile as an area in need of improving infrastructure for pedestrians. The study suggested the city develop a pedestrian overcrossing near Riverside or Tustin avenues. Looking ahead the city aims to have a redevelopment master plan complete in October, with commission and council hearings potentially scheduled for November. A second public workshop could be scheduled before the master plan is completed. In the meantime the city will be reaching out to stakeholders in hopes to receive specific feedback of how Mariners’ Mile could look like once future plans are finalized. Nova added there is a possibility the city hosts a third public workshop in October. 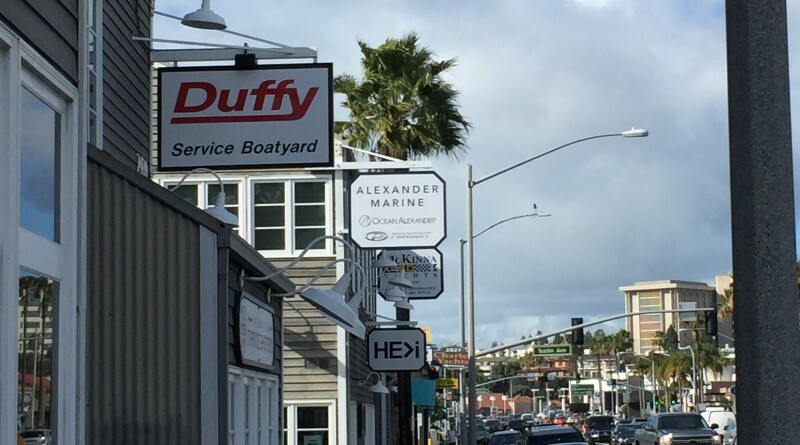 The future of Mariners’ Mile became a hot topic recently after the land parcels where Ardell Yacht and Ship Brokers was located were sold in January. Newport Beach’s Harbor Commission brainstormed the redevelopment of Mariners’ Mile at a meeting in March. The City Council held a study session about the nautical village during its May 24 meeting. Beyond Newport Beach many other Southern California waterfronts currently have potential redevelopment projects in play to draw more visitors to their respective areas. The Port of San Diego is considering a project to bring a Space Needle-like structure, large aquarium, marina, restaurants and shops to the downtown area waterfront. Port officials are also looking at plans to build a hotel project at Harbor Island, a major boating destination. The port is also looking to upgrade Chula Vista Marina. Meanwhile construction is already underway at Dana Point Harbor, where Orange County officials have sought to revitalize the waterfront with new slips, shops and restaurants since 1997. Construction of Lido Marina Village in Newport Beach is already underway. The updated neighborhood would feature boat slips, restaurants, shops and a public pier if all plans were realized. Los Angeles County has plans to upgrade portions of Marina del Rey to include shops and restaurants no different than the waterfront projects in Newport Beach, Dana Point and San Diego. Just the same the city of Los Angeles wants to create the L.A. Waterfront in San Pedro to rival waterfront destinations in San Francisco and Santa Monica. Residents and boating interests in Redondo Beach have been actively involved with a planned waterfront redevelopment at King Harbor, where CenterCal Properties hopes to build a center where visitors can dine, recreate, shop and watch movies. There are also plans to bring shops, restaurants and a hotel to Channel Islands Harbor as part of a redevelopment project involving the city of Oxnard and county of Ventura. The only other Southern and Central California waterfront locations where boating activities appear to be the dominant theme are harbors in National City, Oceanside, Ventura, Santa Barbara and Avalon. Unfortunately you don’t mention the fact that they are also planning for a high rise luxury apartment building at the Fisherman’s Wharf at Channel Islands Harbor. A private developer wants a 65 year lease on the public land there… Right across from the Navy Base of Port Hueneme. There are already too many apartments & other residences in the area. I am so jealous of all the exciting visionary development at the other marinas & harbors. Public land should be used for public use!